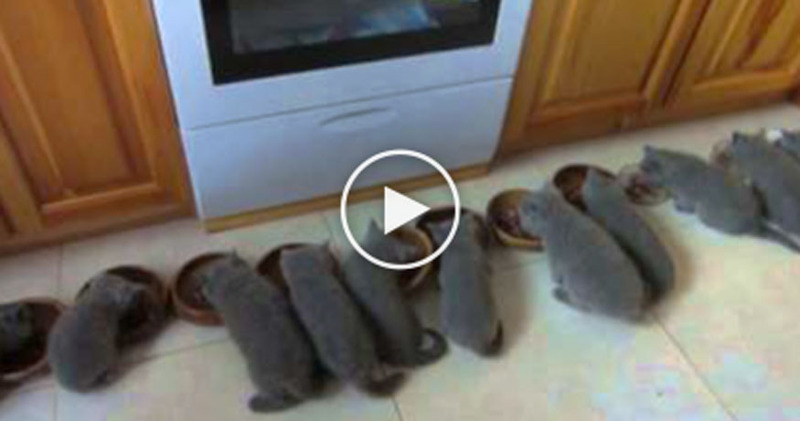 Home » Videos » 12 Kittens All Eating At The Same Time, Just Watch The Results… This Is The CUTEST Thing Ever, OMG!! This cat family is HUGE, it consists of 12 almost identical grey kittens! They’re fluffy, adorable and just about the cutest thing in the world! But when they’re eating together?? You’ve gotta see them! It’s simply priceless… This adorable moment is just TOO cute for words!! Feeding all these kittens requires many feeding dishes and takes up the entire kitchen! OMG, this is pure cuteness! !—SHARE this cute story with your friends! !